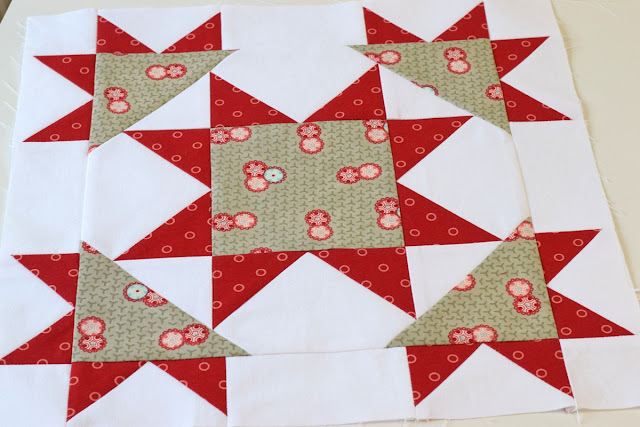 I am happy to share with you a quilt block I made while reviewing a new pattern, Vintage Star, for Cheryl at Meadow Mist Designs. The block measures 13" x 13" unfinished and is made from two Bonnie and Camille prints, Red Lollies from Hello Darling and Retro Gray from Ruby. When reviewing patterns for Cheryl, I normally check the math and read through looking at the wording, punctuation, etc. 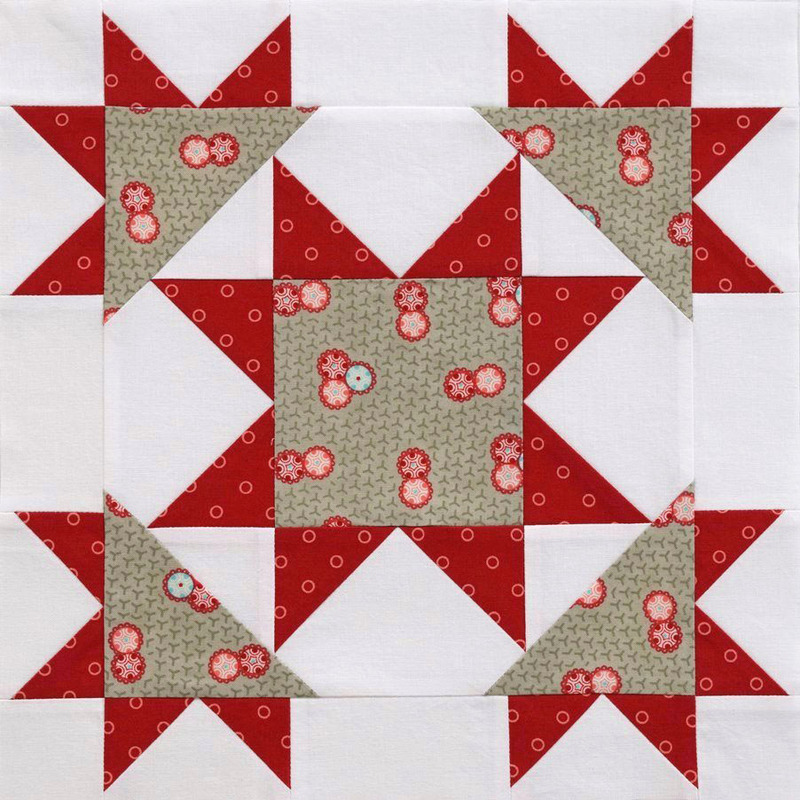 I just make the blocks and quilts in my head without even touching the rotary cutter but Vintage Star was different. The trimming of the inner star mid way through the assembly of the block was something that I had not done before and wanted to test it first hand. I was very pleased with the sharp points of the inner star. 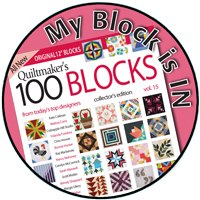 While I wouldn't consider this a block for a beginner to tackle, Cheryl takes you step by step with easy to follow written instructions. And her illustrations are the best for you visual learners. 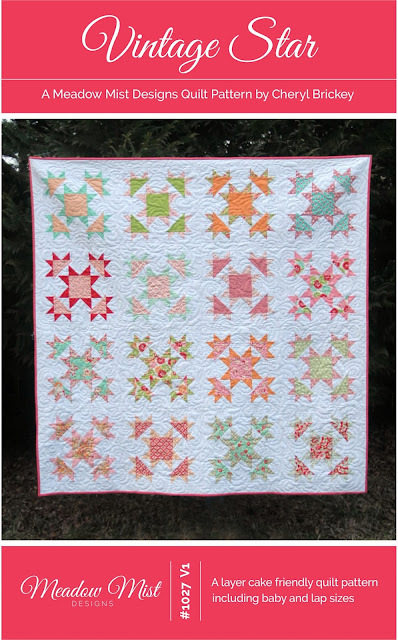 Vintage star is available in digital format through Etsy and on Craftsy. The printed version is available on Etsy. Check Plus is Cheryl's other pattern release this week and you can see the versions made by the pattern testers and find the links where it can be purchased in her blog post here. Both of patterns are each on sale for $7.50 through Oct. 4th. This is a Check Plus block I made to go on the back of a baby quilt, Sundae Plus. 1. Leave any comment and tell me which pattern is you favorite if your name is drawn. The first one drawn gets the first pick. 2. Followers, old and new alike get a second entry. Just let me know how you follow, whether it be Bloglovin', Instagram or email. Linking to Let's Bee Social, Needle and Thread Thursday, Whoop Whoop Friday, Fabric Frenzy Friday and Show It Off Saturday. Another very generous giveaway. " Check Plus" would be perfect for adult grandson's room next year as he continues his university studies. 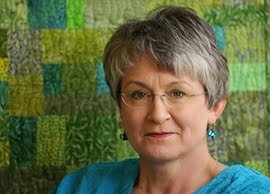 I follow you on my list of quilty friends with my blog . Very nice blocks...I like the check plus pattern the best. Your blog is in he sidebar of my blog. You did a wonderful job with those blocks Paige! They are beautiful. I love Cheryl's patterns and it's hard to choose a favourite here but I would have to go with Check Plus. And I follow you via Bloglovin'. Lovely block you made up there Paige. I would love to be entered into the giveaway - I would chose Vintage Stars if I was lucky! Your blocks are lovely! If I were to win and need to choose, I'd love the Vintage Stars pattern. Thanks! I am drawn to the Check Plus. Your blocks are so pretty! 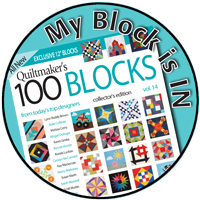 I follow you on quiltedblooms.com. Love the first block whose name has escaped me! I'd be happy to win either, but really like Vintage Star. I just added you to my bloglovin' list. Vintage Star is my favorite-both are lovely! Check plus is my favorite! :) And I follow you on IG and through Feedly. I would love to win a copy of the Vintage Star pattern! Both quilt patterns are amazing! I've been drawn to Check Plus since I first saw it! 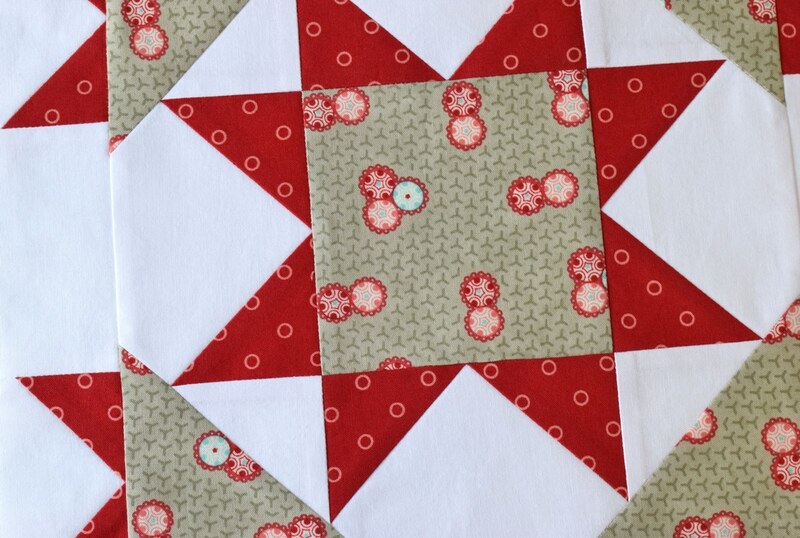 I like that the outer piecing on the Vintage Star doesn't have to line up--less bulk is good! Vintage Star is just my style. Both these patterns are lovely. I would pick Vintage Star to use up my 1930s stash. And I just followed you via Bloglovin. Lovely patterns, modernista in me says: Check Plus! I have been following on Bloglovin. Two great patterns - I think Check plus is my favourite! 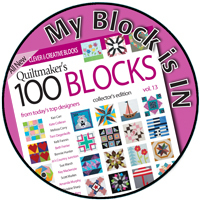 Beautiful block, thank you again so much for testing and reviewing for me! I would have to chose Vintage Star. What a beautiful pattern that would be enhanced with so many varieties of fabrics. Thank you for the opportunity to win this awesome prize! I follow you by email and on Bloglovin'! Just signed up a short time ago and am really enjoying your posts! The Vintage Star block that you made is lovely and your points are perfect. Very inspiring! Thank you for sharing and for the give away opportunity! Have a fantastic creative day! I like the vintage star pattern. Love your version of Vintage Star and I'd love to win that pattern. I would love to have the vintage star pattern! Vintage Star is my favorite. I follow you via email and on Bloglovin"
My favorite is check plus. Both patterns are great but I like Check Plus pattern. What beautiful colors in the vintage star. I like both. I followed you in Bloglovin and emails. Vintage Star gets my vote!!! I love star quilts, so the Vintage Star pattern would be my first choice. I love star blocks. so my favorite is the Vintage Star! 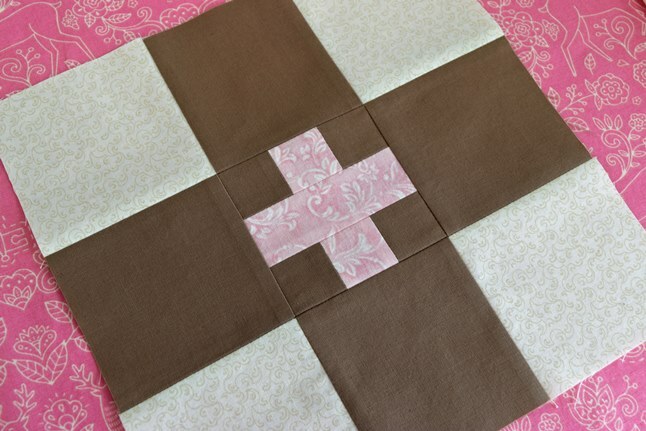 I really like the Vintage Star block so that block would be my first choice. I started following you by email. 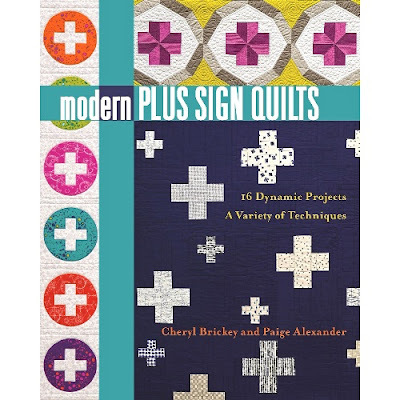 I have really become interested in applique in the past several months and while searching for info on applique, I found your website! Love your creativity! I really like the fabrics you chose for Vintage Star (also my favorite of the two). I follow your blog via email - thanks for the giveaway. You've done a lovely job with this block, Paige. I would choose the Check Plus pattern. Both of these patterns are lovely, but I think the check plus would be my first pick. I follow your blog by email, and also follow you on IG. 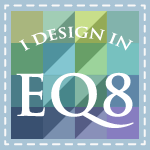 Your skills are so amazing and I'm sure they make you the perfect pattern tester! It's so hard to choose, but I would probably go with the Check Plus pattern. I must say though, that your block of Vintage Star was my favorite. 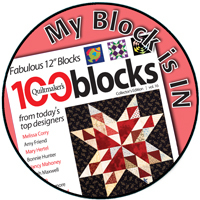 I love the Vintage Star pattern and your block looks perfect! Love the Vintage Star block! And I follow you on Instagram. What a great giveaway! Beautiful job on both blocks. I would be happy with either pattern. I think I would be a little more likely to do the Check Plus pattern because it looks a little easier. Thanks for the chance to win! Vintage Star is my favorite--would love to win! Both patterns are amazing. But I think my favorite is Check Plus because it is something different. I love the vintage star. It looks intricate but I can see it will make a beautiful quilt. I would love to follow by email. I'm going to search out the link to do so. Thank you for the opportunity to win one of these patterns. Love your Vintage Stars pattern. I'm a new follower via Bloglovin'. vintage Star is my favourite; if I don't win it I will be buying it!! Really really like your version in B&C fabrics. I follow you on bloglovin and on Instagram! I love your versions! My favorite is vintage star. Each pattern is phenomenal. You would think a math major would pick Check Plus. I know I like Vintage Star even more. I adore stars. Thanks for hosting the giveaway. I left some love for Cheryl on her blog. 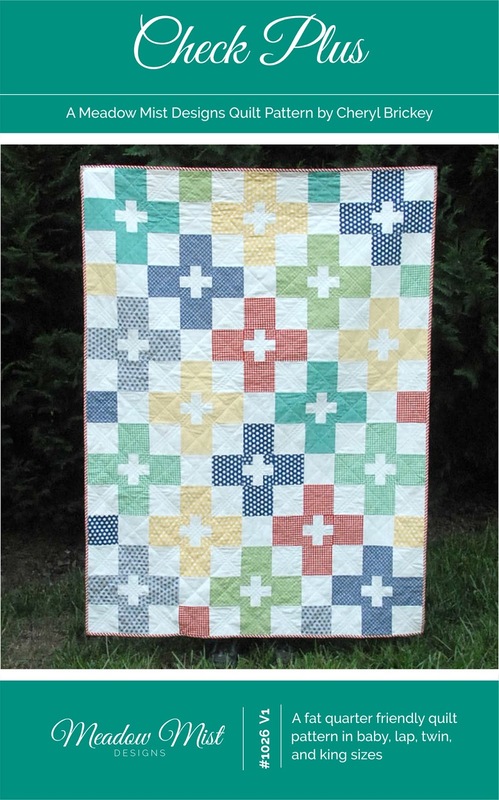 I like both patterns, but I think I'm more likely to actually make a quilt using Check Plus. I really like the colors you chose for that vintage star. Very nice! Both patterns are lovely; tough choice! Maybe the vintage star? I'd certainly be happy with either! Thanks for the chance! I love that star in those Bonnie and Camille fabrics! If I had to pick one, I would say the Vintage Star, but both are great. I can see all of the color potential in both of them. And I follow you via my blog reader and Instagram. Thanks for picking me, Paige! I went through my 30s stash yesterday, and have the fabric pull for a baby size. (My neighbor is due in January.) Can't wait to start.